England’s cathedrals are the nation’s glory. They tower over its landscape, outranking palaces, castles and mansions. They attract roughly half the nation’s population each year. For a millennium they have been objects of pilgrimage for those seeking faith, consolation and beauty. Still at the start of the twenty-first century, they remain unequalled in their size and splendour. More than any other English institution, cathedrals reflect the vicissitudes of history and should be treasured as such. They are custodians of culture and of the rituals of civic life. They offer welfare and relieve suffering. They uplift spirits with their beauty. In a real sense they are still what they were when first built a millennium ago, a glimpse of the sublime. 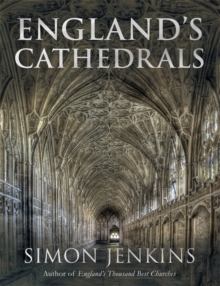 Gloriously illustrated throughout, England’s Cathedrals not only offers us a companion to England’s Thousand Best Churches, it takes us on an enthralling tour of the nation and its history, through some of our most astonishing buildings.